There are some strange things on the internet. Some years ago, an old friend introduced me to the amazeballz child’s toy/craft that is Konapun. For those not in the know, which I would imagine would be about 99.999% of my readers, Konapun (and its sisters, Whipple, Kracie Poppin Cookin, and Re-Ment) are all crafts that involve making tiny, extraordinarily detailed simulacra of food, using eeny-beeny utensils and kids’ play kitchenware. Over many months, we watched many, many Youtube videos by the master, RRCherryPie, as s/he methodically created pretty much the entire repertoire of every company listed above. 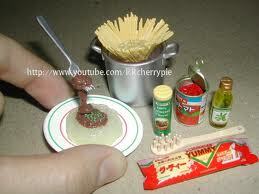 If they released it, RRCherryPie did a Youtube video on how to make each perfect, tiny little creation. We marveled at the extraordinary patience, steady hands (and MONEY!) it must have taken to create each of these works of art. Some were edible, most were not, but they were all were fascinating in their own ways. Some, like Re-Ment (which is the name of a miniature toy company in Japan), are actually plastic miniatures of food that you assemble to make a meal, if that’s your bag. Very kawaii. To me, they are best known as the company that sells kits for making plastic erasers that look like food, and pre-made plastic versions of miniature food, as well as all of the insanely tiny kitchenware for pretend cooking your miniature fake food. 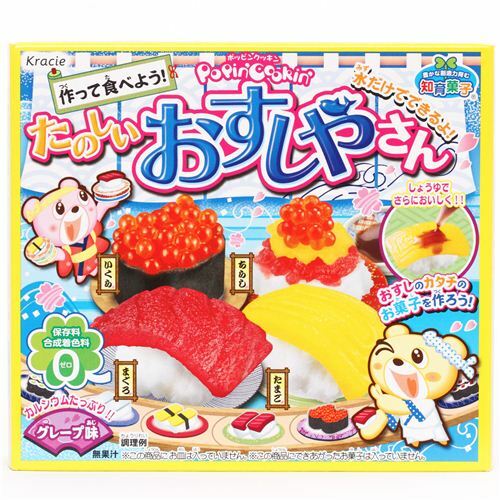 Kracie Poppin Cookin, on the other hand, is actually a series of edible candy making kits, but I included it here because it’s hella fun! If you like making your own (usually jelly) candies in amusing shapes and then eating your creations, this is the kit for you. Konapun, however, is truly my favourite, as these complex kits require mixing small amounts of mysterious powders with a few cc’s of water in tiny little mixing bowls, using miniature knives and spatulas, and really getting into making the fake food…and the results are truly astonishing. The final products may be inedible, but I don’t think I’d want to eat my creations if the results were as perfect as these! Previous Post The Knitting Demon Strikes Again! Next Post Happy World Pride Week…in Knitting!